This is a flyer created in the East Bay on presidential candidates and gay marriage, primarily for distribution to activists in the "No on 8" campaign (initially with phone bankers who used our Berkeley campaign office as a spillover location from the Democratic Party office across the street). To print it, download the PDF version, which prints on a single 8.5 by 11 inch sheet of paper. 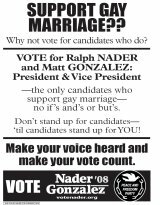 There are also old leaflets locally produced for the Nader/Gonzalez campaign, and downloadable versions of nationally created Nader/Gonzalez literature. In the future, this page may include descriptions, thumbnail images, and links to printable PDF versions of campaign literature for various local Peace and Freedom Party candidates. In the future, this section may include additional descriptions, thumbnail images, and links to printable PDF versions of regional and statewide slate cards, flyers about one or more of the statewide propositions, and other campaign literature that is not primarily about any particular Peace and Freedom Party candidate, as was done on the 2004 campaign website. 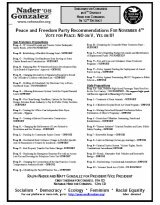 This flyer lists the recommendations of the San Francisco Peace and Freedom Party for offices and local ballot measures on the November 4th general election ballot. To print it, download the PDF version, which prints on a single 8.5 by 11 inch sheet of paper. This page was last updated on 3 November 2008.